Sam Westrop, the director of the Middle East Forum's Islamist Watch project, was interviewed by Al-Jazeera TV on March 23 to discuss the recent terrorist attack outside the British Houses of Parliament in London that left four people dead and at least 50 injured. ... What do you make of this attack? Are there links to other similar attacks we've seen throughout Europe recently? Oh, of course. And the number of truck attacks, knife attacks we're seeing across mainland Europe. Britain hadn't escaped these attacks; it had merely been lucky. Islamists had been trying to do this and now they've succeeded. This is fast becoming the norm. It was back in 2010 that Al-Qaeda, in Yemen encouraged its followers to use vehicles as a weapon, describe them as "ultimate mowing machines." Then ISIS picked up on this in 2014. Now it's becoming standard operating procedure for these terrorists. "These attacks require no preparation, no resources, no money." And the real nightmare about this attack, this method of murder, is that it requires ... no preparation, no resources, no money. They don't need to make or buy illegal substances. They just get in their car, they pick up their kitchen knife, and the mayhem begins. Now the problem with this is, of course, is this lack of a network, this lack of resources, this lack of planning, means it's going to be incredibly hard for law enforcement to detect the plot before it happens. Who knows how long they even spend planning these attacks? Now in the case of London, we just don't know enough to say exactly what happened. Now you say that this is a pretty easy attack, and I hear what you're saying, the fact that you can just get into the car and just plow through people, but what's going though that person's head? What drives them and motivates them to do something so horrific? Well, quite clearly, Islamism. ... [A]nd if radical Islam is the problem, then moderate Islam is the solution. 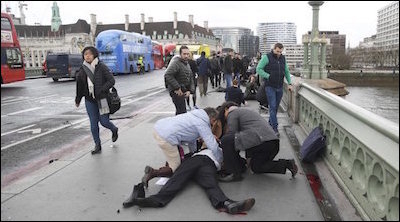 Bystanders assist a victim of the attack on Westminster Bridge in London. The government, law enforcement, and civic society need to work with moderate Muslims to identify and challenge Islamism that has taken root in so many Muslim communities around the world. And London is obviously no exception. There is no mystery as to why this is happening. Islamism, an international ideology, funded by particular countries in the Middle East and around the world, that is encouraging young Muslims to hate non-Muslims, to work towards a caliphate, and to kill in their attempts to do so. That is the problem. We know what it is. Now we have to find a way to challenge it. You know, there's been an outpouring of sympathy, obviously as you can imagine. The White House spokesman Sean Spicer says U.S. President Donald Trump has spoken to the British Prime Minister Theresa May ... [to pledge "the full support of the U.S. government in responding to the attack and bringing those to justice who are responsible."]. Sam, obviously that indicates what a global problem this is and how much focus there is on fighting these so-called terrorist groups. Does that sort of comment help? How does this feed into Trump's rhetoric? Well, look, the Middle East Forum, for which I work, is an apolitical organization. We certainly don't agree with everything Trump says, but we are pleased that finally there is a president who is prepared, at the very least, to name the threat – Islamism – that is hijacking Muslim communities, attacking moderate Muslims, attacking non-Muslims. That pleases us. We don't quite know what his solutions are. Little detail has been given by the Trump Administration, so we'll wait and see. "It's important that the West stands together against this global menace." As for the expressions of sorrow and platitudes coming forth, they're always welcome. it's important that the West stands together against this global menace. It's important that West stands with moderate Muslims against this global menace. But real action is needed here and that's something we're not hearing from many governments. We need an international effort to identify those Islamist networks and sects that are radicalizing entire Western communities. For the man, the woman, on the street, going about their business, just be vigilant? Is that key right now? Well, of course, and especially Muslim communities, the more cooperation between them and law enforcement, the better. Everyone should be vigilant. We should be worried because this isn't an abstract threat. There are possibly thousands of supporters in the West who are prepared to carry out these attacks. Everyone should be worried. This is our life. This is the future of the West for the next many years, possibly decades to come. This is the new model. Ominous warning there. Sam Westrop, thank you.